OME Series sanitary liquid ring pumps provide new capabilities for handling products with entrained air. By using a specially designed impeller, cover, and housing, pumps maintain their prime when other pumps become air-bound. This feature makes the more efficient for complete evacuation of tanks and lines during normal process or CIP. The pump uses a special impeller and extremely tight internal tolerances to produce a liquid ring of fluid inside the pump. Once this ring is formed, the pump both liquid and air while producing vacuum capable of lifting 23 feet. The OME self-priming capability, combined with its ability to produce a vacuum, makes it an excellent CIP return pump when complete removal of fluids is needed. Because the pump CIP solution containing air, it replaces centrifugal pumps and the need for air eliminators and check valves on the discharge. With the processors no longer have caustic cleaning solution discharging onto the floor. The pump can produce several inches of vacuum in the inlet piping and lift water up to 23 feet in a 2″ pipe from drums and sumps. 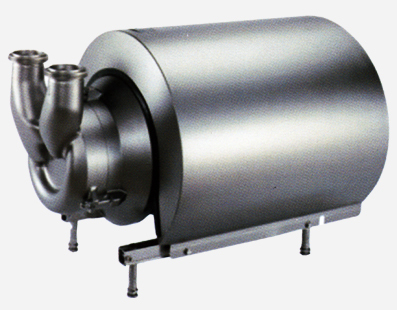 This makes the pump ideal for drum and tote unloading and removing whey from cheese vats. Other typical applications include ice cream mix, sweeteners, glycerin and reclaimed water. Processors have found the pump not only removes product from tanks, it can also pull remaining foam and solution from lines saving product and money.